Fish pie needn’t be an expensive option. 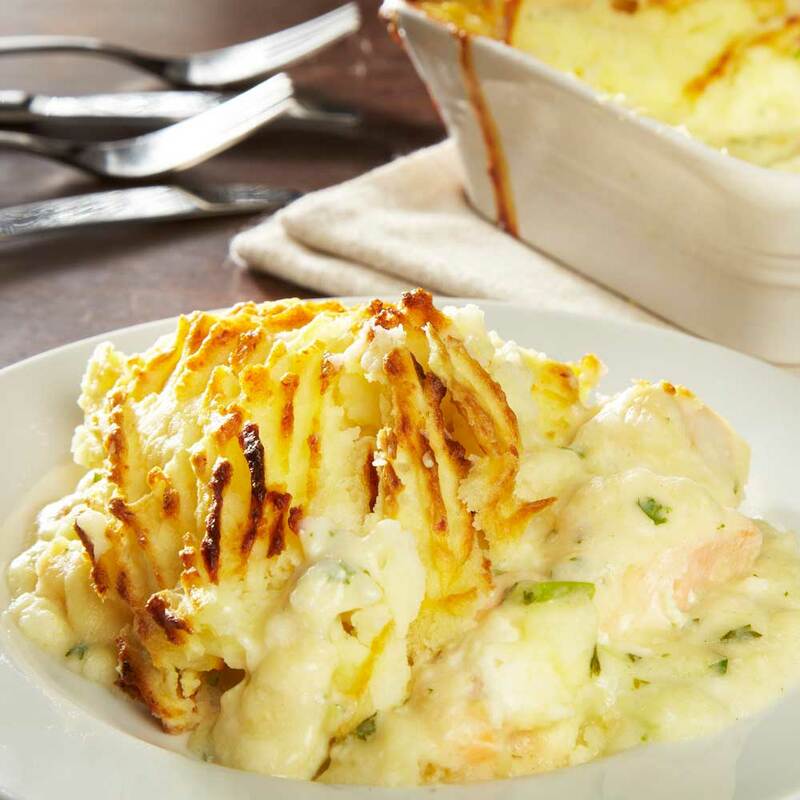 This recipe uses frozen mixed diced fish cooked in a delicious creamy sauce and topped with golden mashed potato. 600g Maris Piper Potatoes – peeled and cut into large dice. In a non-stick pan, melt the butter and add the leek. Cook gently for 4 minutes, taking care not to burn the butter or the leek. Add the flour and mix well. Stir over the heat for a minute or so. Add the milk a little at a time, stirring well over the heat to form a smooth paste after each addition. Keep it moving so it does not burn. When you have added all the milk, you should have a smooth sauce. Crumble in the stock cube, turn the heat right down and leave to gently cook for a couple of minutes. Add the parsley and grated lemon zest and remove from heat. Place the fish into an oven proof dish. Pour over the sauce and set aside until the topping is ready. Preheat you oven to around 180C. Place the potatoes in a large pan and cover with cold water. Add a little salt, place on the heat and bring to the boil. Turn down and gently simmer for 15-20 minutes. When the potatoes are cooked (a fork should go through one with little resistance), remove from the heat and drain well. Place back into the pan and place the pan on a very low heat to try and dry out the potatoes a little before mashing. Mash the potatoes well until all the lumps are removed. Add the butter and melt in, then add the egg yolk and mix well. Pipe or spoon the potato on top of the filling. Sprinkle a little smoked paprika on top and place into the over. Cook in the oven for 20-25 minutes until the top is nicely browned and everything is cooked through and piping hot.